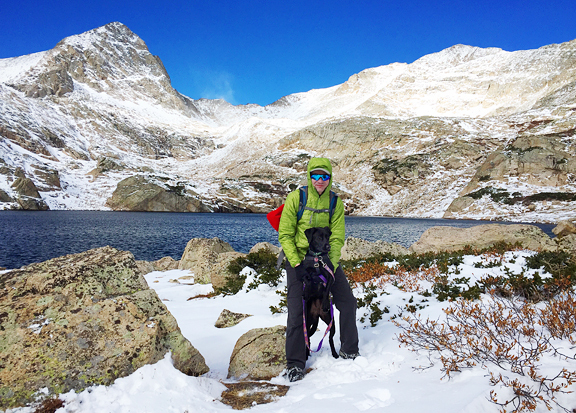 When the coasts are getting snow and rain, Colorado typically sits under a high pressure ridge which means sunshine and warm weather. Sometimes we’ll get clipped by the edge of a storm and experience a little rain, and if we’re lucky the temperatures aloft will be cool enough to give us snow instead of rain. So far, what little rain and snow we’ve received has been teasing us in the mountains. On Saturday, we experienced some dynamic weather – low clouds racing by and sun showers popping up every which way. In the morning, there was a long-lived rainbow to the west of our house as spot showers rolled through intermittent sunshine. When we took Neva for a hike, we could see a rainbow on the far horizon, but it was mostly obscured by forest. It lasted for a couple of hours as rain clouds continually spilled over the mountains. I tried to get a photograph, but I could never see the entire rainbow because the rainbow itself was quite low due to the high sun. 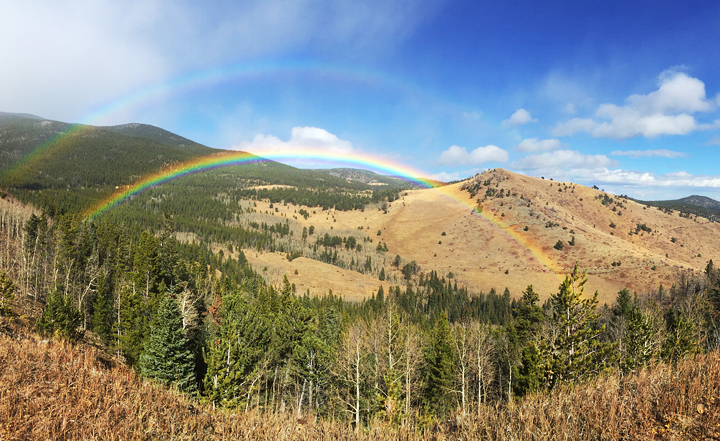 As we drove home through bouts of rain and intense sun, we rounded the bend and saw yet another rainbow, but this time it was in a valley below us – the perfect geometry for the afternoon sun. Wind-driven rain pelted me and everyone else who had stopped to marvel at this stunning phenomenon. “Did you find the pot of gold?” a woman shouted over the roar of the winds, smiling. “Colorado IS the pot of gold!” I answered. This weekend, we collapsed Neva’s bedroom crate in the hopes of getting her used to sleeping in the doggy bed at night AND staying there. She loves her bed, which is currently decked out with three pillows (she’s spoiled) and a super soft blanket. However, Neva has figured out how to position herself on our bed without disrupting our sleep and thus avoiding getting kicked off in the middle of the night. Since she isn’t much of a snuggler, lying between our feet suits Neva just fine. 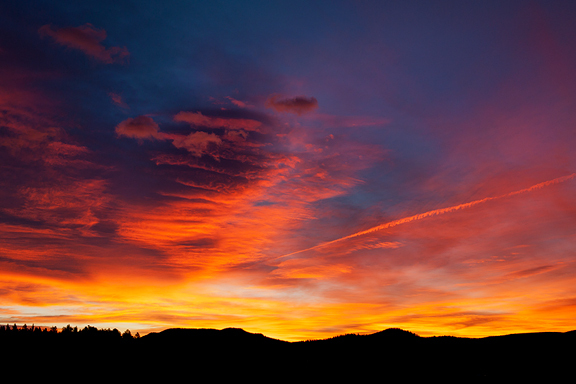 It worked so well, I was able to get up for sunrise without that pukey feeling when you haven’t gotten proper rest. Between Jeremy’s travel schedule, the start of “wind season” in the mountains, and the looming end to Daylight Saving, we had some of Jeremy’s colleagues up for dinner a few nights ago. Darkness isn’t a problem, unless you’re trying to find our house for the first time. People always ask if we eat dinner party food all the time, and the answer is no. After entertaining, we enjoy simpler fare. One dish I’m digging lately is roasted delicata squash. These oblong, dark green-striped yellow squash are everywhere in stores and markets right now. 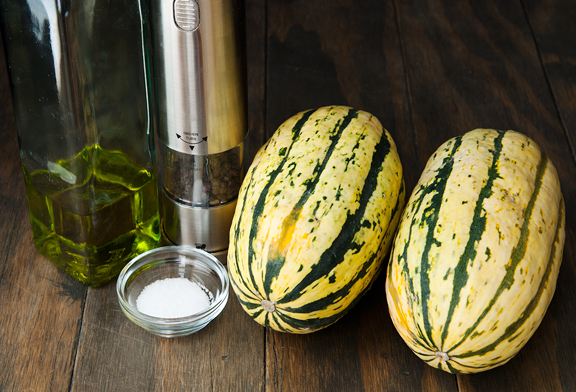 Delicata squash are easy to prepare and you can leave the skin on (and eat it) unlike some other squash varieties. 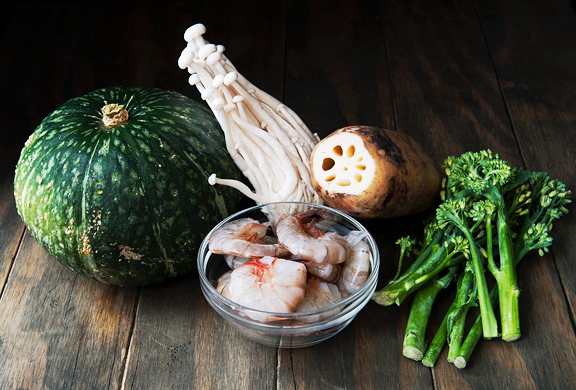 The preparation is straightforward, simple, and quick – the perfect dish for fall and winter. 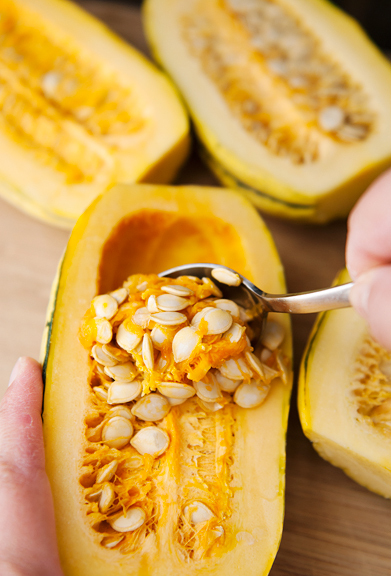 Cut the squash in half lengthwise, scoop out the seeds, and slice into 1/2-inch thick pieces. 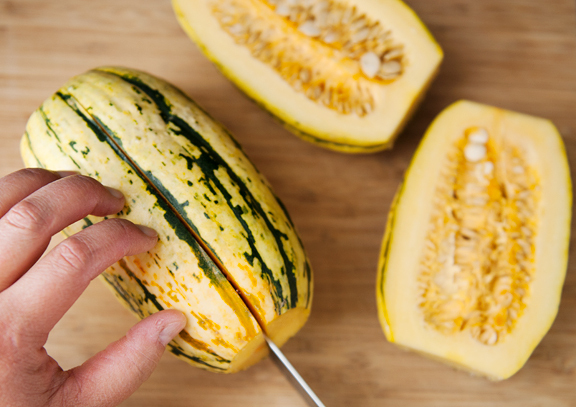 While delicata squash are not nearly as hard as butternut squash, they aren’t going to slice like butter. 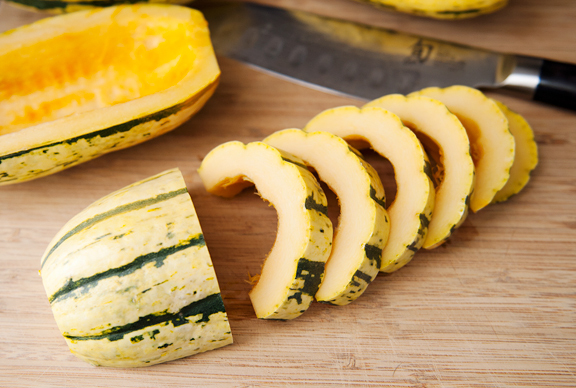 Do take care when cutting the squash – especially on that first lengthwise cut. This seems to be the year of maintenance and catch up. Those things you do every four, seven, or ten years on a house all managed to drift into 2016. Or it feels that way because with two homes, you get a double whammy. But it feels good to tick those things off the list so they aren’t nagging at me throughout the winter. I’ve also been systematically tackling the clutter inside the house. It’s amazing what you can do when your puppy is now an “adult”. With this extended warm spell pushing deeper into fall, we’ve been granted the time to tackle these end of summer tasks that sometimes get kicked to the following year. My parents left for California this weekend and our lives are resuming a routine of work, exercise, and perhaps a hint of a social life. Earlier this month, a care package arrived for me from Seattle. I don’t get care packages that often, but when I do, they are always awesome because my friends and relatives who send care packages are the best kind of care package senders. This box of love came from my friend, Tea, who unlocked the ultimate care package achievement. 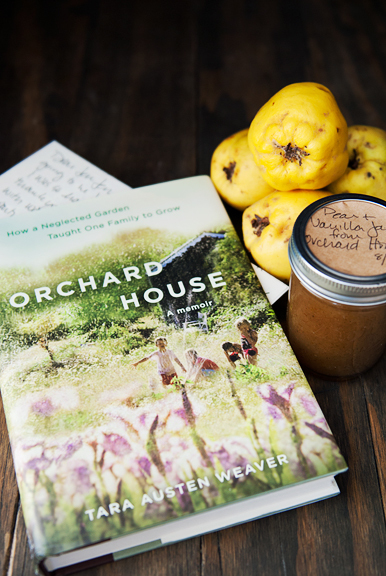 It contained fresh quince she had picked from a tree (interesting or exotic or fresh food item), a hand-written letter (long lost tradition), a jar of homemade jam (handmade gift), and her latest book (her art). For me, it doesn’t get much better than this. Quince are fascinating. They look like a peach-fuzzed cross between an apple and a pear, but the flesh is hard and tastes terrible raw. 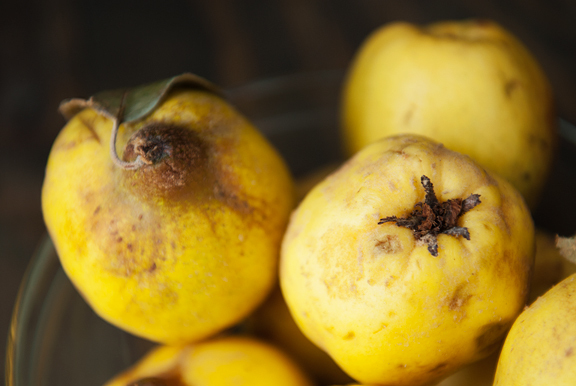 Once cooked, quince transforms into a divine sweet treat. 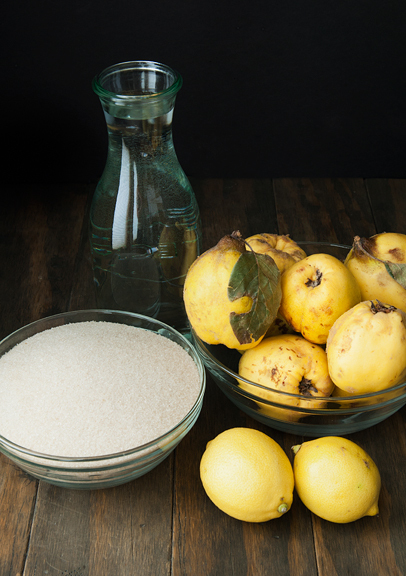 I’ve gotten my hands on quince a couple of times in the past and made membrillo, but I wanted something simpler. Quince jam is a gooey version of membrillo, but it tastes just as lovely with less work. 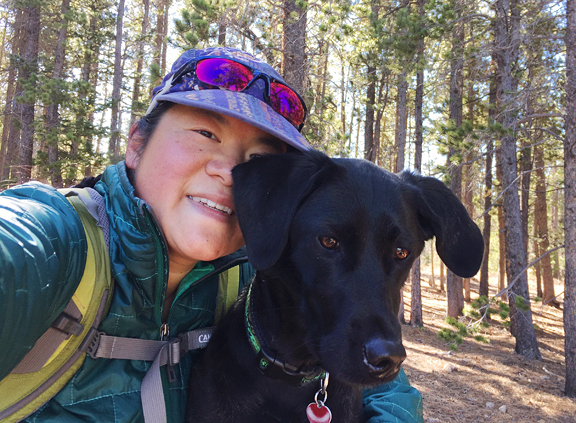 I’m trying to make the most of shoulder season – that period between summer season activities and winter season activities. 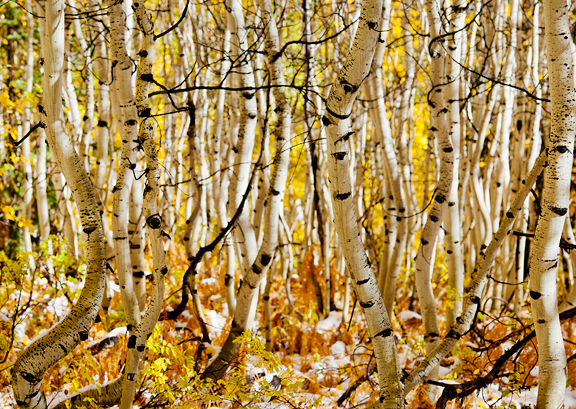 Autumn is glorious, but it can also be a little frustrating with the back and forth between hot weather and snow. It’s far too sketchy for any skiing that won’t result in massive gouges on the bottoms of our skis. Hiking and trail running up high is a bit sloppy with the diurnal melt and freeze. 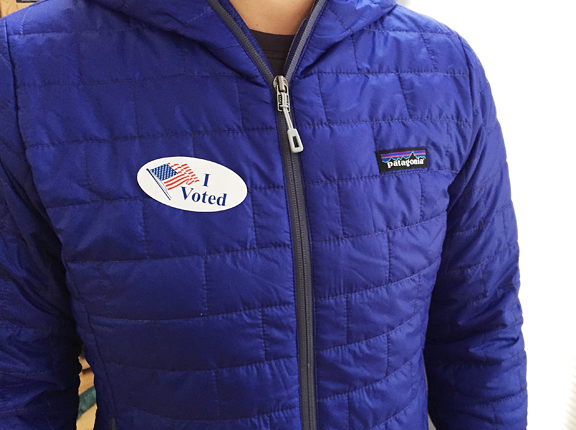 We’re making due with whatever exercise we can get right now, all in the hopes that we won’t be sucking wind when we finally slap those skis on. Plus, Neva doesn’t care WHAT the season is nor WHAT the weather is doing, she just loves to be outside. 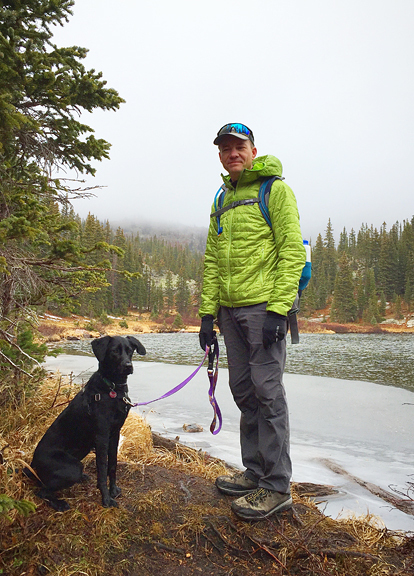 My parents are back in Colorado for a couple of weeks to sample a season other than summer. They are not fans of winter and snow, and I’ve warned them that crazy (i.e. snowy) weather can happen any time between October and May, but they took the chance. Luckily, the snow has stayed up here in the mountains. 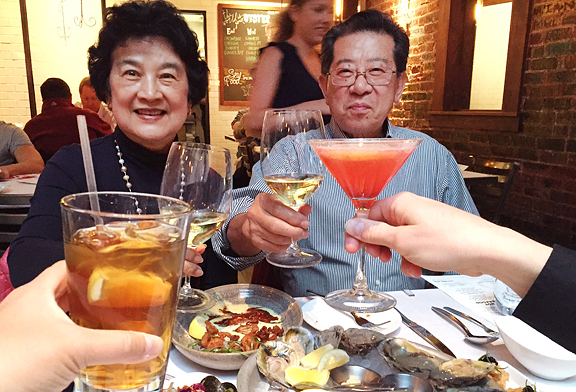 It happened to be Dad’s birthday last week and the plan was to have my folks up to our house for a celebratory dinner. But Dad’s back was acting up and I didn’t want him driving the canyon, so we prepped as much as we could and then brought dinner down to cook at my parents’ place in Boulder. When I entertain, I typically plan the menu and let Jeremy pick the wines to pair. 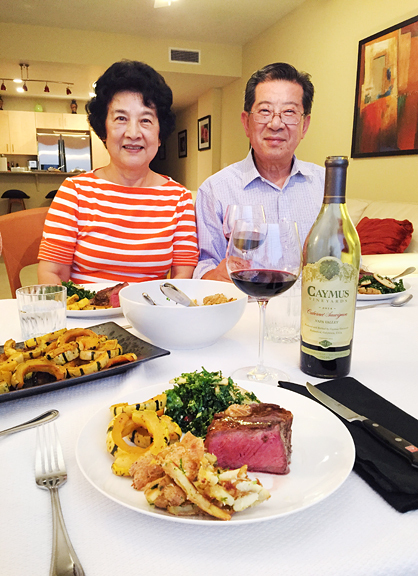 But whenever I cook for my parents, Dad picks the wines he wants to serve and I create the menu around the wines. As darkness encroaches on both ends of the day, we find Neva requesting dinner earlier and earlier in the evenings. The orbit of the Earth around the Sun is messing with her internal doggy clock pea-brain. I have no idea how she’s going to deal with Daylight Saving ending in November. It’s a bit of an adjustment for me, too. More so for Jeremy. It seems we also cue on the daylight for dinnertime – eating as late as 10 pm in the summer, which I don’t really like. One of the positives of the winter months is that I feel good about eating dinner at 7 pm and having a few hours after dinner to digest. We also find ourselves dining out less in the darker months. I think that’s partly because we’re getting older and partly because I can cook some meals better at home for less than it costs to go out to eat. 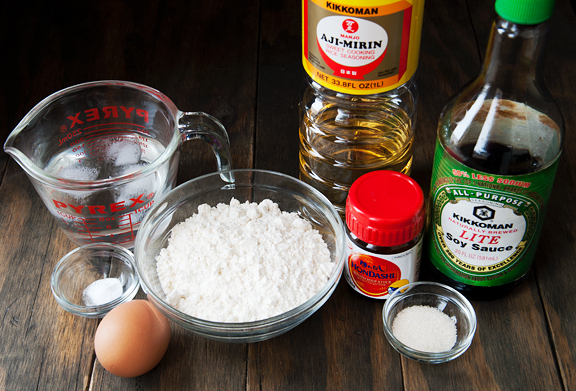 Jeremy and I still love to go out for sushi since it’s hard to source that much variety in fresh sushi-grade fish at home, but I have given up on ordering tempura because I find it far easier to make my own using my favorite ingredients for the dish.